Honeycomb Alternative! Acers Tabletpräsenz war bisher sehr zurückhaltend, gewinnt aber nun mit neuen Modellen immer mehr an Fahrt. Das Iconia Tab A500 bietet eine Nvidia Tegra 250 Multicore CPU/GPU, 32 GB Speicher, einen hochauflösenden WXGA-Bildschirm und das brandaktuelle Android 3.0 Betriebssystem. Was man von dem 500,- Euro Flachmann erwarten kann, haben wir getestet. Wer die komplette Tablet-Checkliste berücksichtigt, kommt am iPad nicht vorbei. Es ist schneller und ausdauernder als die Konkurrenten, und nur Apple hat sein Ökosystem aus Apps und Medien schon fertig. Ein klasse Bildschirm und ein überdurchschnittlich gut verarbeitetes Gehäuse für nur 500 Euro: Das Acer-Tablet ist eine echte Alternative - mit kleinen Schwächen. Das auf Android 3.0 basierende Acer Iconica A500 kann von der Verarbeitung her auch vor kritischen Augen bestehen. Denen wird zudem ein mit 10,1 Zoll und 1024 x 800 Pixlen Auflösung bequem ablesbares Display geboten. Der im Vergleichstest mehrmals verwendete Begriff "Iconica" dürfte ein Fehler sein. Android Honeycomb 3.1 and subsequent updates will likely bring innovative features to the Iconia Tab and potentially to the tablet world, something Google must do to overcome the iPad's dominance. For now though, if you are going after the best possible tablet experience I would likely spend the extra $100 and get an iPad 2. Despite the inclusion of Flash and more flexibility in the OS and expansion options, today iOS is definitely more polished and smooth. The difference in weight doesn’t sound like much but after handling both tabs extensively, it will eventually catch up to you and you’ll appreciate having the slimmer iPad. The A500 is a handsome device that is aggressively priced and delivers on almost every front. It’s definitely worth a look. Of course in the current market one cannot discuss tablets without mentioning the iPad 2. The A500 is 5.3mm thicker and 160g heavier, which will be a deal breaker for many users, although the price is certainly right. But Acer has definitely produced an alternative, if not a killer, that Android fans will appreciate. Still, for the price the Iconia is a lot of tablet for your money. You’re getting the features of a laptop – minus the keyboard – on a device that can fit in a satchel. If the device we had was 3G-capable, the Iconia could have been our top Android tablet. 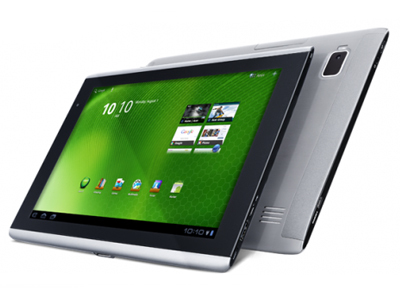 The Acer Iconia A500 feels similar to every other Android Honeycomb tablet once you get past its design. However, we're not crazy about some of the bits that Acer is responsible for. The look lacks confidence and the bold strokes of a real designer, it's also missing any cool extras like the keyboard dock of the Eee Pad Transformer and the screen falls short of IPS alternatives. What's more, the overall Android tablet experience still doesn't match that of the iPad when it comes to apps. We'd be happy to use this device as our everyday tablet companion, but would we splash out £450 on it? Probably not, given the other options out there. Overall, you can’t go too far wrong with the Acer Iconia Tab A500 and it’s certainly worthy of consideration if it fits your budget and you crave that USB port or HDMI. Given how quickly Acer prices tend to drop, it could soon be a bargain too. But the design will deter some as it just doesn't look as good as it's competition. 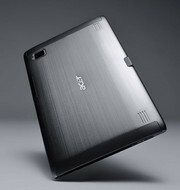 Acer has produced a fine product with the Iconia Tab A500. Its performance closely matches that of the Motorola Xoom but it is lighter, offers more connectivity and has a working microSD slot to expand the storage capacity. There was no 3G support in the model I tested but I thoroughly enjoyed using it just the same. It is, however, almost as expensive as the Xoom, so those on tighter budgets should consider the 16GB version which costs around £380. There are many good points. The speakers are better than Asus’ Transformer. Battery life, at over ten hours, is brilliant. Uniquely, the Iconia A500 also comes with the same kind of haptic feedback we're familiar with from Android phones, which makes typing on the touch screen more reliable. ?And the price is right. At £450 this 32GB model might seem expensive, but there's a 16GB version on the way which will cost £70 less. But for all its pro points, the question remains. Why would you buy the Iconia A500 over any other Android tablet? We think probably not. In conclusion all I’ll say is that the Acer Iconia Tab is nothing remarkable in the state it’s in right now. Hardware wise it’s pretty solid, especially with the inclusion of the full-sized USB port, but it cannot reach its full potential until Google improves functionality with the next Honeycomb update. The Iconia tab is just good enough, not great. The only other thing working in its favor right now is its low price tag. Certainly, anybody who’s looking to get a new tablet should probably have a look at the Acer Iconia Tab, but right now the tablets market is still in it’s infancy to provide an experience rich enough to replace netbooks. If you're set on buying an Android tablet today, the Iconia Tab is one of the best bets at this writing--it tops the Xoom in functionality, and its $450 price is significantly cheaper than the $750 no-contract price of the G-Slate. The Iconia Tab is no iPad-killer, but it does give hints of the power of Android's more open and flexible platform. While I found faults with the Iconia Tab itself, many of my gripes lie with Android 3.0; if Google could only fix that OS's issues and get the native app ecosystem jump-started, Android tablets might be on to something. In all, our impressions of the Iconia A500 are mixed. It feels a little slicker than the Motorola Xoom in use, and there are some useful bits of software included. It’s nicely designed too, with cameras that do a passable job of shooting the odd picture and video clip. Battery life, however, isn’t quite up there with the Xoom’s, and the screen isn’t as attractive as the Transformer’s. And at £447 for the Wi-Fi only version, it's hardly any cheaper than the iPad 2. As with the other Android 3 tablets we've seen so far, it’s almost there, but it still doesn't feel quite like the finished article. But if a consumer had both an Acer A500 and an iPad 2 (or heck a, iPad 1,) and wanted to avoid appearing to have the same technology as everyone else, what then? Acer’s made a tablet that looks like none other, and it’s got a nice sound system on it, and it’s mostly metal, and it’s light. And it feels nice to hold, and there’s a USB port in it. And the SDcard port works. What other reason do you need? The Acer Iconia A500 Android tablet offers many benefits: a sturdy and well constructed design, USB and HDMI-out ports and the attractions of Android Honeycomb 3.0. It's a little chunky and heavy, and the screen is difficult to see in sunlight, but overall we were impressed by this tablet PC. 76.77%: Weltbewegend ist diese Bewertung nicht. Obwohl es bei den meisten Websites einem "Befriedigend" entspricht, muss man bedenken, dass es kaum Notebooks gibt, die unter 60% erhalten. Verbalbewertungen in diesem Bereich klingen oft nicht schlecht, sind aber oft verklausulierte Euphemismen. Dieses Notebook wird von den Testern eigentlich als unterdurchschnittlich angesehen, eine Kaufempfehlung kann man nur mit viel Wohlwollen darin sehen.